Embedded PXI: Wild Idea or Wild Card? Two seemingly unrelated product introductions, one from Aeroflex and another from Teradyne, have something in common. Any guesses? Aeroflex is expanding its S-series family of RF benchtop instruments. Teradyne is expanding its ICT (In Circuit Test) line with functional test cards. What these both have in common is that they are embedding PXI to deliver the added functionality. Let’s start with Aeroflex. In the video embedded in this article, you can see the new products are bench RF instruments. Two VSGs (Vector Signal Generators) that can reach 3 and 6Ghz, and two VSAs (Vector Signal Analyzers) that achieve 6 and 13Ghz. The video touts the human interface and bench use, but the article begins by making it clear that the internals are PXI. Now look at Teradyne. This article announces that Teradyne has created a special card for their in-circuit tester that can house up to 4 PXI cards. It is essentially a flat PXI chassis that occupies a tester slot, and can route the signals between the PXI instruments and the standard Teradyne pin electronics. This allows the ICT to perform functional test as well. The Teradyne card is actually a mini-PXI chassis. See the video here to get a better understanding. With two allowed per system, a total of 8 PXI cards can be integrated with the Teradyne ICT system. Two different markets. Two different implementations. One common intent: leverage the expanding offering of PXI into adjacent markets. Let’s face it- bench instruments are not the ideal candidates for PXI due to lack of human interface and a challenging initial system setup. Aeroflex solved that by embedding turnkey bench functionality into a traditional box product. Similarly, Teradyne is leveraging the PXI ecosystem as functional adjuncts to their ICT play. Wild idea? Perhaps. It’s clearly a pragmatic move by both companies. Just call it clever. Wild card? Definitely. It’s another use of PXI that could change the paradigms. A bench product that is largely PXI- is that a modular or bench instrument? Who cares, as long as it adds value to the solution? It could be the ticket to expand PXI into a number of markets that weren’t considered top candidates for modular. The same thing goes with the Teradyne solution. Why not exploit the PXI ecosystem for mixing in-circuit and functional test? Embedding PXI, and other modular standards, is a true wild card. As the portfolio of modular instruments increase, there will be more opportunities to leverage the ecosystem to address new segments. There are many combinations, and they may not be conventional or obvious. 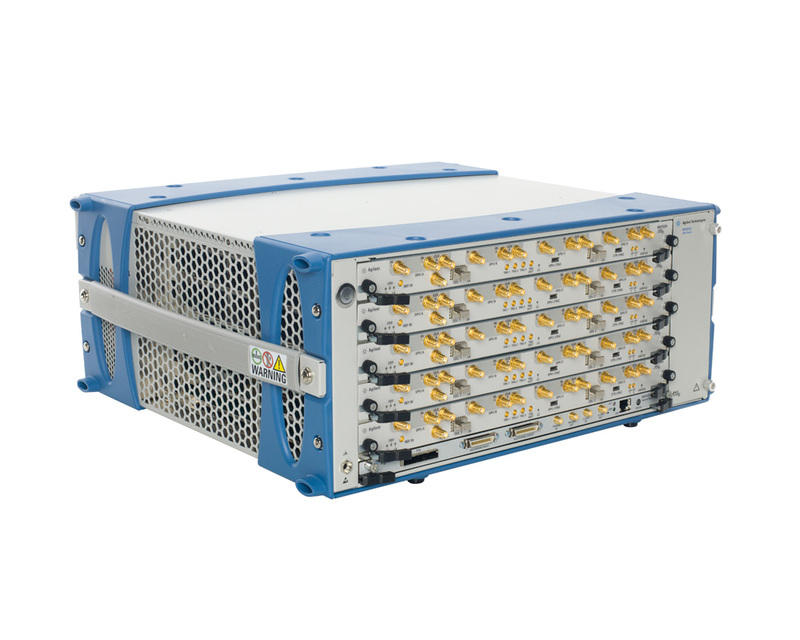 The recent Agilent introduction of PXIe-based Optical Link Modules for network analyzers is another example. Once we discard the “either-or” paradigm, that a product must be modular or traditional, but not both, we open ourselves to new possibilities. Aeroflex and Teradyne have given us two good examples. The AXIe 2.0 Base Software Specification specifies the software necessary to support AXIe chassis, system modules, and instrument modules that comply with AXIe 1.0 Base Hardware Architecture Specification. The AXIe 2.0 Base Software Specification builds on the PXI software specifications in much the same way that the AXIe 1.0: Base Hardware Specification builds on the AdvancedTCA® specifications. Specifically, AXIe software is required to substantially comply with PXI-2, the PXI Software Specification and PXI-6, the PXI Express Software Specification. This permits AXIe system software to be supported by existing PXI utilities; it also facilitates integrating systems composed of both PXI and AXIe components. Translation: AXIe has essentially adopted PXI-2 and PXI-6 specifications lock, stock and barrel to force compatibility of the architectures and re-use of existing PXI utilities. From a software point of view, the AXIe modules are just very large PXI modules. Of course, there will be system differences, such as when controlling the timing and triggering resources on the two chassis types, since AXIe has different topologies. But even here the goal is to make them the same except when the physical differences compel them to diverge. This compatibility with PXI should be able to enable some interesting mixed systems of AXIe and PXI modules. Right now, combined systems are configured as two separate PCIe hierarchies, such as two PCIe interfaces coming from a desktop computer. Future ones could be more intimate. For example, it should be possible to use an extender such as the recently announced NI PXIe-8374 to extend from a PXI chassis to an AXIe chassis. Alternatively, it should be possible to treat an AXIe module as an embedded PXI chassis where standard PXI instruments could be inserted directly into the AXIe environment. AXIe 2.0 is a critical step in ensuring that AXIe truly is the big brother to PXI, in software as well as hardware. Expect to see the specification posted soon on the AXIe specification page. When I say madness, I mean that in a positive way. AXIe was missing this critical product category until Guzik recently released the ADC 6000 Series. The virtual ink wasn’t even dry on my blog this week when Agilent announced the M9703A AXIe Digitizer. Those are impressive specs. And like the Guzik AXIe digitizer, it delivers them with remarkable channel density. Let’s look at what can be packed into 4U of rack space. There are 8 channels of 1.6Gs/s at 12 bits on each AXIe blade. With 5 AXIe slots in a 4U package, that’s 40 acquisition channels per chassis. The channels can be interleaved, allowing each blade to support 4 channels of 3.2Gs/s each. That’s 20 channels of 3.2Gs/s in 4U. 40 high-speed digitizing channels can be deployed in 4U of rack space. Reproduced with Permission, Courtesy of Agilent Technologies, Inc. The M9703A also allows up to 4GByte of data memory and is supplied with four customizable Virtex-6 FPGAs. Like the Guzik product, the data link to a computer is PCIe Gen 2. The Agilent and Guzik products are not competitors; they deliver complementary speed/resolution tradeoffs. Between them, AXIe now offers digitizers with sampling rates of 1.6G, 3.2G, 10G, 20G and 40G, all at world-class densities. Think about what a remarkable two weeks this has been for AXIe. When the AXIe standard was announced, a common question was, “why do we need another standard?” The response was typically a technical summary of module sizes, bus structures, power supplies and cooling systems. Yes, you could imagine the increased density due to the deeper profile and robust cooling system. You could also imagine clever uses of the 62 lane wide local bus. But unless someone actually offers real products that exploit these features, it remains an unproven hypothesis. Along comes Guzik Technical Enterprises of Mountain View, California, and their announcement of the ADC 6000 family of high-speed AXIe digitizers. Hypothesis proven. There’s also a 3 channel version with improved bandwidth. These are very impressive specifications, but two other things particularly stand out. Each blade can have up to 64 GByte of memory. Yikes! That’s a G, not a K or an M. Try to put that much 40Gs memory onto a single PC board, and you will realize what AXIe can bring to the table. If that is not enough, Guzik took advantage of AXIe’s high-speed local bus, and is able to stream data at full bandwidth to additional memory cards or digital processors. I spoke with Lauri Viitas, Marketing Manager at Guzik, about the product. He claims that even when loaded up with memory, the AXIe platform delivers double the density of the other form factors, such as PXI. So I tested the hypothesis. The 20Gs and 40Gs products have no equivalent in PXI, but the 10Gs/s does. In PXI, a user can concentrate 10 such channels into a 4U PXI chassis. In AXIe, a 4U chassis hosts 5 slots, each with 4 channels. That’s 20 channels in the same rack space, or a 2 to 1 density improvement. This is where both form factors bring their particular strengths. PXI products generally offer superior granularity and can be mixed and matched with other PXI products. AXIe products offer advantages of pure density and performance. The application will drive the choice of form factors. Speaking of applications, where does the Guzik product fit? Guzik has a rich background in disk drive testing, so I assume this is a good match. The ADC 6000 family will also find a home where the density of a large number of synchronized channels is critical. “Big Physics” comes to mind, as well as many aerospace and defense applications. The AXIe Consortium has positioned AXIe as the big brother to PXI since it’s creation. Kudos to Guzik for delivering a compelling proof point. Welcome to the Modular Matters blog! Welcome to the first Modular Matters blog post! Modular Matters is the blog of the related news portal Modular Connections. Modular Matters will add frequent commentary about the modular instrument industry, authored by me, Larry Desjardin. My topics will vary. Sometimes I will cover a major event in the industry. Other times I will offer perspectives that are not apparent from merely reading the straight news. My goal is to add a new post at least once a week, and more often if the situation demands or I feel particularly inspired. Some may be lengthy. Some may be a single sentence or link. Some will confirm the obvious; others may be controversial and provocative. I hope all add some insight about the modular instrument industry. Let me start with why I launched Modular Connections. Simply put, the industry needs this type of news aggregation site. There’s a lot of great coverage of modular instruments in the media. Great articles, great cases studies, and exciting new products being announced. The electronic press is doing a pretty good job in this regard. However, finding these articles isn’t so easy. Now it can be. Modular Connections uses a diverse set of resources: press news sites, vendor news sites, consortium newsletters, RSS feeds, LinkedIn Groups, and even email and telephone tips. Then we link to those sites. We do the work so you don’t have to. That’s one advantage: one stop shopping for the news. There’s another advantage. By concentrating the news, patterns emerge that may not be apparent to an occasional reader. One is how applications are being addressed by open modular standards. A quick overview of the articles in the past 2 weeks bears this out. Whether it is the case studies publicized by National Instruments, or the 60-Ghz Wireless Test Solution by Agilent, tough problems are being solved by exploiting the advantages of modular instrumentation. This blog further complements Modular Connections by adding a third dimension: insightful commentary. Finally, I want to invite press, vendors and users to participate in Modular Connections. Though we’ve built a pretty good network of finding daily news, we can’t possibly find it all. Let us know of anything we’ve missed. Perhaps it’s an article we overlooked, a new case study, or a new product being announced. As long as it has to do with the open systems of PXI, VXI, or AXIe, it belongs in the news. Send it to us at info@modularmethods.com, and we’ll get it into the next day’s daily digest. Welcome to Modular Connections, and welcome to the Modular Matters blog!